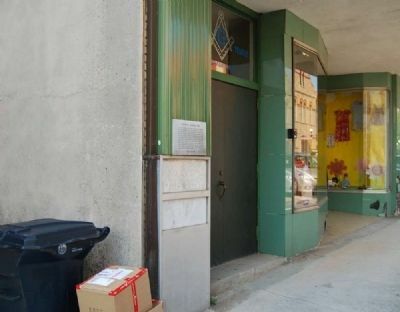 This is the second Masonic Temple to occupy this location. After its organization in 1848, Hiram Lodge No. 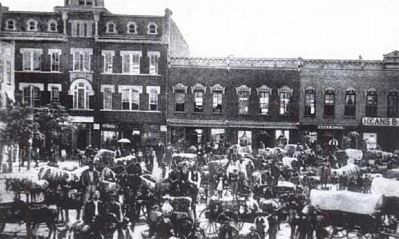 68 met in the second story of a store building on the east side of the square for several years. 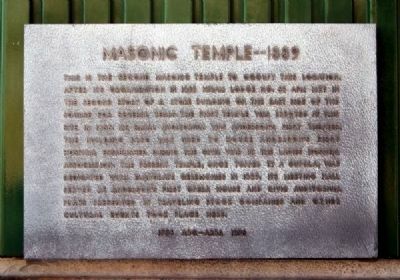 The first temple was erected at this location in 1866. Its small auditorium was Anderson's first theater. The building also was used to house Anderson first hospital established during the Civil War as the Ladies Hospital Association. The present temple, once topped by a cupola, was dedicated with elaborate ceremonies in 1889. Its meeting hall served as Anderson's first opera house and civil auditorium. Plays presented by traveling stick companies and other cultural events took place here. Hiram Lodge, No. 68, A.F.M. Instituted Oct. 29, A.L. 5847. [Lower] Hiram Lodge, No. 68, A.F.M. to the left of the temple entrance. Marker is at or near this postal address: 118 East Benson Street, Greenville SC 29601, United States of America. Touch for directions. Other nearby markers. At least 8 other markers are within walking distance of this marker. In Commemoration of Black Pioneers (within shouting distance of this marker); Bank of Anderson Building - ca. 1891 (about 300 feet away, measured in a direct line); G.F. Tolly Building -- c. 1910 (about 300 feet away); The Four Way Test (about 300 feet away); Sullivan Hardware Co. -- 1875 (about 300 feet away); Portman Shoals (about 400 feet away); Portman Dam and Power Plant (about 400 feet away); Anderson County Court House -- 1898 (about 400 feet away). Touch for a list and map of all markers in Anderson. It’s two stories stand there, showing little except plain windows, grayish brick walls and a sign. The exterior doesn’t hold a lot of clues as to the treasures inside. But thanks to a small metal sign, posted near the doorway, those walking by can catch glimpse into the story inside. In small letters, the plaque tells the passer-by that this plain-Jane building has had many lives since 1889. St. in downtown Anderson — a place that has housed an opera theater, a hospital during the Civil War, a community center and a Masonic Lodge. It is also a place of mystery. On this day, a small group gathered here and tried to tell its story, walking through its rooms and the place that once hosted Vaudeville acts. Anderson County Museum Curator Alison Hinman and two Masons — Charles “Spoon” Huggins and Jake O. Phillips — pulled out more details, expanding on the short tale contained on that metal plaque. It is the second Masonic lodge located in downtown Anderson. The first one was a log cabin, of sorts, built near where the Bailes Building is now, Phillips said. Traveling theater groups would use the building — performing in what is still this place’s prized room. In fact, it is this room that has brought me here. Once inside, I know why someone else requested that I write about this place. Blue, like the moon, covers parts of the ceiling. Some places are yellow. Columns surround the walls, and royal blue-cushioned wooden chairs sit in rows along the rim the room itself. It’s a room of reverence, a place mixed with royalty and religion. is modeled after King Solomon’s Temple. And its blue overtones are for another reason. For years — well since 1889 — the city fathers met here. This was this building’s first purpose. It was one of two Masonic lodges in Anderson. In another room, there are rows of photos. Most are black-and-white framed portraits of those men long gone. Names pop out even to the transplanted Andersonian. James Orr. G.F. Tolly. J.L. Tribble. This city’s street names are under these photos. The men who made this town are here. G.F. Tolly was mayor for at least seven terms in Anderson. One of his descendants, Hinman said, is Fred Tolly, who served on Anderson County Council for a number of years. Then another photo shows James L. Orr, the leader or past master of this lodge. He was also the governor of South Carolina. His funeral — the largest in Anderson — was attended by 2,000 to 3,000 people in this building, Hinman said. Confederate Memorial in Anderson’s courtyard. The first picture here dates back to 1847-1848, when the lodge was founded. Then along another wall are pictures in color. Modern movers and shakers here. Huggins’ and Phillips’ portraits hang here, too. Faces of city police detectives, businessmen and politicians are here. This is the fellowship hall. “It’s like a Who’s Who of Anderson,” Hinman said. 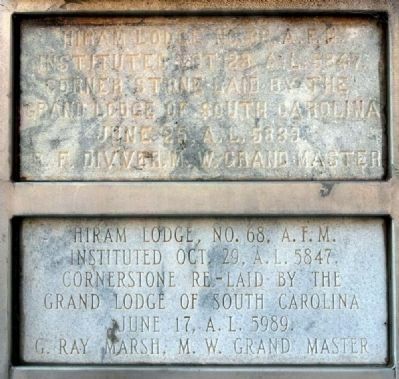 According to A Brief History of Hiram Masonic Lodge, No. 68, the ornate room, the one built like a temple, was erected in 1916 and 1917. It is this room where it is believed the opera performances and later theatrical shows were held. 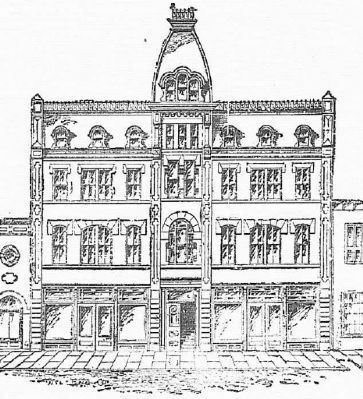 Then a “little theater” was placed in the building, Vandiver writes, from around 1889 until 1913. There Vaudeville acts as well as operas were performed. Horses were brought into the building and housed on one of the floors, according to local history books. The opera house was located on the top floor. At times, horses were included in the vaudeville shows. They were taken to the top floor via stairs. The building has since been renovated and the top floor removed. in 1913 and 1914 on Whitner Street, where the Alverson Community Theater now stands. “It had a formal opening and the newspapers of the time are enthusiastic over the happy culmination of dreams and aspirations of many years and states the interior of the house rivals fairyland,” Vandiver wrote. 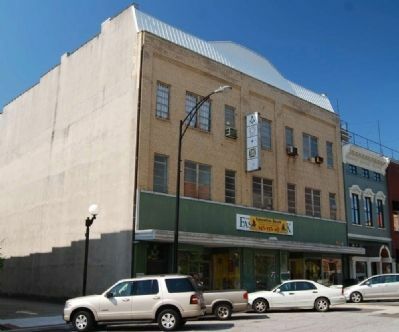 With the moving of the theater, the building’s purpose then shifted to community center and Masonic lodge. A few thousand dollars, not even topping $10,000, built the lodge. Membership peaked several years ago with close to 1,000 members. Now, those numbers hover around 467 members. Times, they are changing. But this place still holds its treasures. On this day, some of them were revealed. Others may die with the building, with the people who come here. Such is the way, many times, with local history. At least, we’ve glimpsed inside this place and learned a bit of the part it’s played in our tale. — Submitted July 30, 2009, by Brian Scott of Anderson, South Carolina. Hiram Lodge, No. 68, A.F.M., was granted a charter on October 29, 1847. Since its organization it has furnished four most worshipful masters, Ex-Gov. J.L. Orr, Jas. A. Hoyt, W.W. Humphreys and R.F. Driver. Two temples have been erected, the first in 1854, which was used until 1889, when the present Masonic Temple was erected at a cost of $25,000. It is one of the handsomest in the State. At present there are 125 members. was held on the first Monday of November 1847 with seven members present. 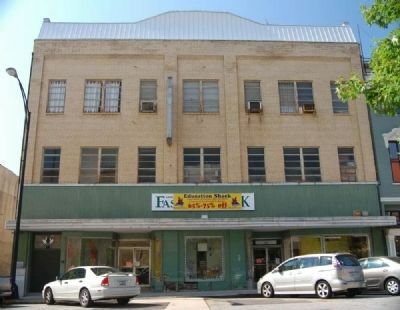 The meeting took place in the rear of the Courthouse located on the east side of the square, near the front of what is now know as The Bailes Building, and were held there for several years. The first Hiram Masonic Temple was erected at the current location by John T. Sloan from the plans and specifications submitted by John B. Wynne and opened while still uncompleted in May 1856. According to the Anderson Gazette the cornerstone was laid on Friday Oct.12, 1855. The first meeting in the completed lodge room was held on Feb.7, 1859. The lodge’s small auditorium was Anderson’s first theater, which was henceforth used for plays, lectures, debates and other entertainments. This building was also used to house Anderson’s first hospital, established during the War Between the States by the Ladies Hospital Association. When troops passed through, they were met by committees carrying refreshment for the troops. Clothing was made for the soldiers; boxes of food were packed and sent whenever it was possible. Many of these ladies husbands, fathers and sons had gone to fight in the war, many did not return. After the war the small auditorium in the lodge was the only theater house in Anderson and as the town grew it became inadequate. Anderson people of that day were not without amusement, traveling players frequently came for a week or more, and if their performance was too elaborate to be given in The Masonic Hall, tents were set up large enough to accommodate the crowds, and with stages that could display the drama. In the early 1880s the members tore down the 1856 temple and put up a new one on the same location. It contained Andersons first Opera House; believed to be adequate for years to come. The first meeting was held in the present building Dec.6, 1889. From the Anderson Intelligencer, Thursday June 27, 1889.The Hiram # 68 Masonic Temple when completed will fronts 65 feet on the Court House Square, and be 90 feet deep. It will be three and one-half stories high, with a mansard roof. The first floor will contains the entrances to the floors above and two commodious store rooms with large cellars underneath. The front of the second story is to be divided into four small rooms, with a ticket office and a lobby, from which you enter the Opera House, which will have a ceiling 26 feet high, and is to be 45 feet wide by 65 deep, a gallery will extend around the walls. On the third floor will be the Lodge Room, which is to be 33 feet wide by 50 feet deep, and surrounded by six small anterooms. The building, when completed, will cost about $l2,000.00, and will be one of the handsomest and most substantial buildings in this section of the state. Mr. A. W. Todd, of Augusta, Ga. is the Architect of the building, and Messrs. Moss & Jackson were awarded the building contract. In the course of time as the city grew the size of the opera house once again became inadequate. And in 1913-1914 when Mr. J. S. Fowler President of the Anderson Development Company built a handsome new theater on Whitner Street, it was later called the State Theater and is now the Alverson Center Theater. The opera house was no longer a profitable endeavor, thus the members over time, 1916-17 and on renovated their building, greatly improving and beautifying it for their own use. And over time the first and second floors were internally reconstructed and both converted to rental property. The opera house was remodeled and became the lodge room proper. The original lodge room was converted into the fellowship hall. The stairwells were reworked, and the means of ingress and regress for all who use the building was somewhat modified. In the early 1950s the members began to see the need to update the aging front of the building. Ledbetter and Earle Architects submitted the plans July 25, 1952, Cromer and Sullivan Contractors. — Submitted December 12, 2010, by Jake O. Phillips of Anderson, S.c..
More. Search the internet for Masonic Temple -- 1889. Credits. This page was last revised on June 16, 2016. This page originally submitted on July 30, 2009, by Brian Scott of Anderson, South Carolina. This page has been viewed 2,544 times since then and 17 times this year. Last updated on November 27, 2010, by Jake O. Phillips of Anderson, S.c.. Photos: 1, 2, 3, 4, 5, 6. submitted on July 30, 2009, by Brian Scott of Anderson, South Carolina. 7. submitted on March 22, 2012, by Brian Scott of Anderson, South Carolina. • Bill Pfingsten was the editor who published this page.